Iain Duncan Smith who was also present at the demo gave his full support and will be meeting Eric Pickles, the Secretary of State on Tuesday for a frank discussion on why L&Q should not be allowed to build on the site when using tax payers money to cover their losses, why the Mayor made the wrong decision and that there is an alternative plan that would provide more social housing than L&Q and still retain the greyhound track! 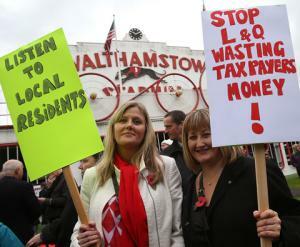 Many thanks to everyone who turned up at the stow today to show boris johnson that we will not accept anything other than greyhouind racing incorporated with affordable social housing on the stow site, i take my hat off to Ricky Holloway and all at SaveOurStow for their brilliant efforts over the last 4 years to secure what the people of waltham forest want at the stow ! Had it not been for the tireless efforts of Ricky and all at SaveOurStow the site would now be a cardboard ghetto! And thank you to Ian Duncan Smith and Stella Creasy for their prolonged and dedicated support for the return of greyhound racing to the stow! The residents of waltham forest are very lucky to have such support from their labour and conservative MP’s Hats off to you both!